Leamington, Ont. – July 6, 2018 – As an international trade war instigated by the Trump U.S. government heated up, Prime Minister Trudeau made a cross country tour that first touched down at the Highbury Canco food processing plant in Leamington, Ontario where about 400 UFCW Canada Local 175 members are employed. In addition to the to the food plant, Trudeau flew to visit a major steel refinery later in the day in Regina. The Canadian food and steel industries are major targets in a looming trade war with the USA. Trudeau’s July 1st visit to the Leamington plant marked the fourth anniversary for the Highbury Canco operation, which purchased the plant from Heinz. 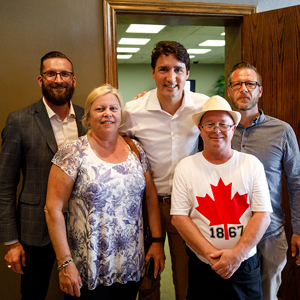 Activists from UFCW 175, including Angela Mattioli, Fred Teeple, Tim Deelstra, and Scott Jackson, had the opportunity to speak to the prime minister as well. “I spoke to the Prime Minister about trade policy and how the government should focus on protecting Canadian workers,” said Tim Deelstra. “That includes protecting the Canadian supply management chain in dairy and poultry,” he adds. Trudeau agreed on the importance of protecting food workers and that the government would be firm on maintaining supply management in our trade agreements (you can read more about Trudeau’s visit to Highbury Canco here). 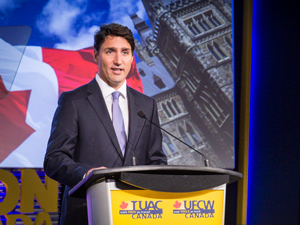 The Prime Minister made a similar commitment to protect the Canadian food production sector in his remarks to the UFCW Canada National Council Convention in Montreal last summer. Add your voice to help protect Canada’s poultry and dairy sectors. Send a letter to the federal ministers responsible for renegotiating the North American Free Trade Agreement (NAFTA) and tell them that Canada’s supply management system is not up for grabs!